Those who consider a 15.6 incher too small, turn to the obviously larger 17 inchers. The R780 faces our tests with the same configuration as its smaller sister, R580. The Core i5-520M and GeForce GT330M were already able to prove themselves as strong companions. Can the big brother redeem the weaknesses of the 15 incher and repeat its advantages? We'll show it in this comprehensive review. 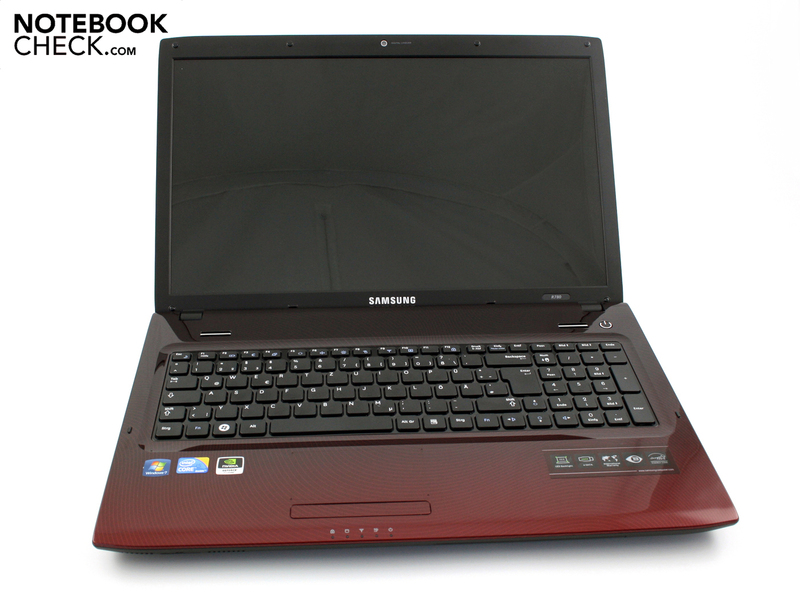 The sister model, Samsung R580, presented itself as a multimedia bolide with a good value for money ratio a month ago. The manufacturer combined the fast Core i5-520M (2.4 GHz) with the new mainstream model from Nvidia, the GeForce GT330M (1024 MB DDR3). This combination of midrange graphics and Arrandale processor aroused the interest of many potential customers due to the attractive price of not quite 800 euro. 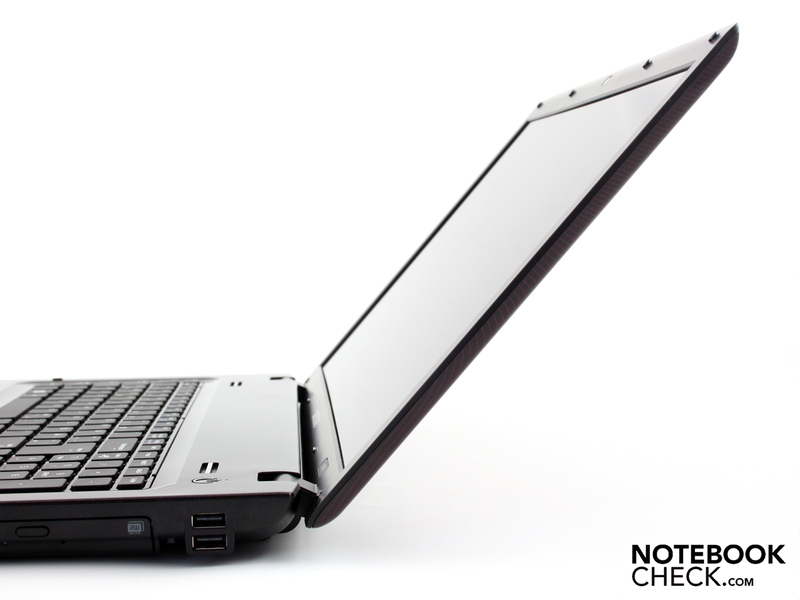 Can the 17.3 incher, with a similar configuration, also fight its way onto the Easter notebook wish list with its ranking? The price of less than 900 euro seems attractive. There aren't any surprises on the technical side. The R780 is an efficient multimedia system, on which many current games run smoothly. Nevertheless, there are still interesting aspects for us. Can the sister model make up for the R580's very contrast poor display? Will the good ergonomic rates of waste heat and system noise be repeated? What's the overall workmanship like? Are the input devices suitable for permanent office work? All answers can be found in this review. The R780-Hero's chassis teases with its looks, just like its 15 inch sister model. 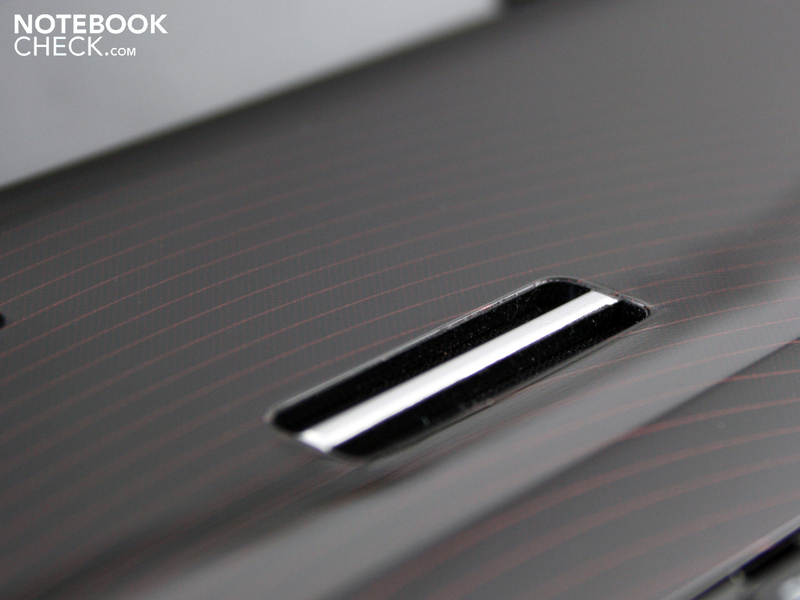 A red-black stripe pattern gleams at us from the lid. This finish changes its color depending on the light incident. There is also a fine gradation. However, there is a difference to the 15.6 incher, where the 3D effect has been omitted in the stripe pattern. Short: The pattern has been made one dimensionally. Samsung continues the look on the wrist-rest and on the work surface. Unfortunately, the high-gloss surfaces attract fingerprints and join these to an ugly greasy film. 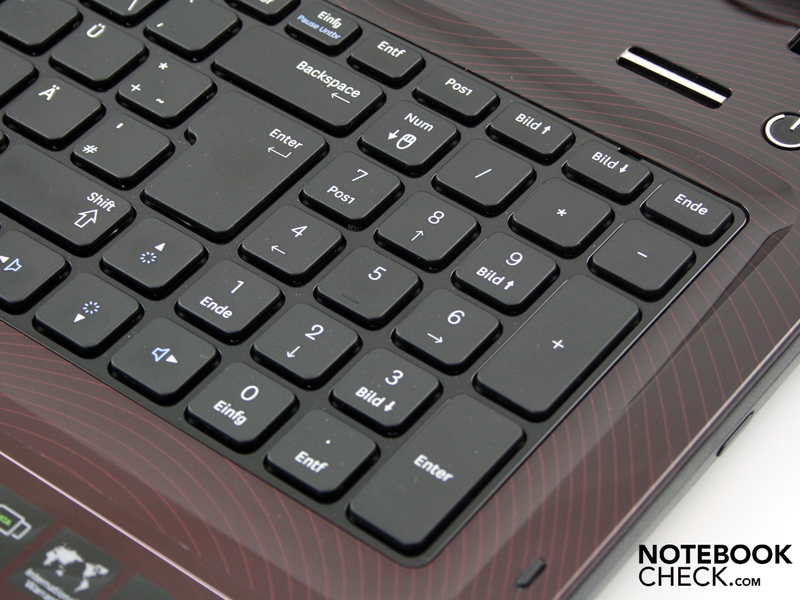 The keys are embedded in a high-gloss grid that seems to be for cleaning reasons. When the keys are pressed, a cleaning cloth (included) can reach the black grid. We can twist the chassis easily with both hands. The wrist-rest is firm, but the key field bends evidently in many areas. The keyboard coils particularly intense over the optical drive. We can dent the lid obviously without much pressure. Pressure marks first turn up under strong pressure, though. The hinges keep the big lid securely in place, but have a slight tendency to teeter. We need both hands to open and close it. 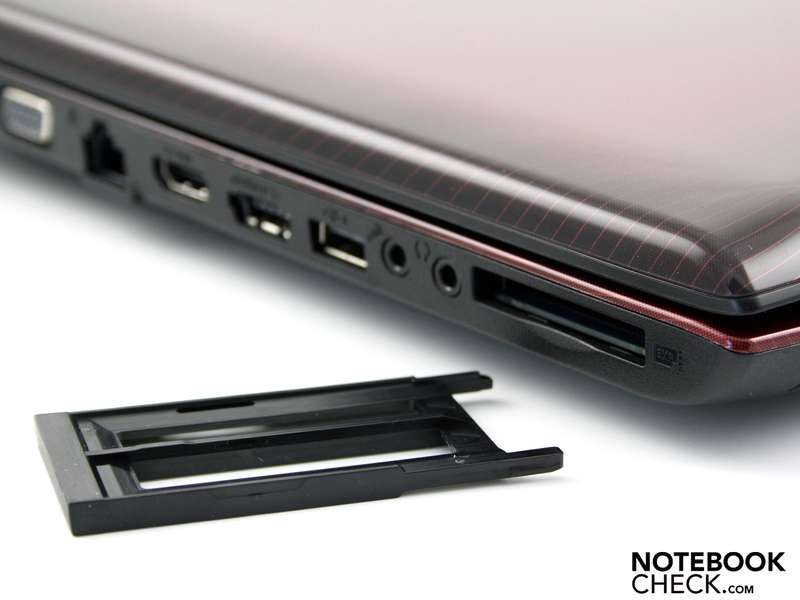 The hinges fit so tight that even the heavy chassis doesn't stay on the desk when we try to open it. The maximum opening angle of about 120 degrees is just sufficient for a use on the lap. The base plate, made of plain plastic, is stable and can only be depressed dent on the fan vents with a finger. 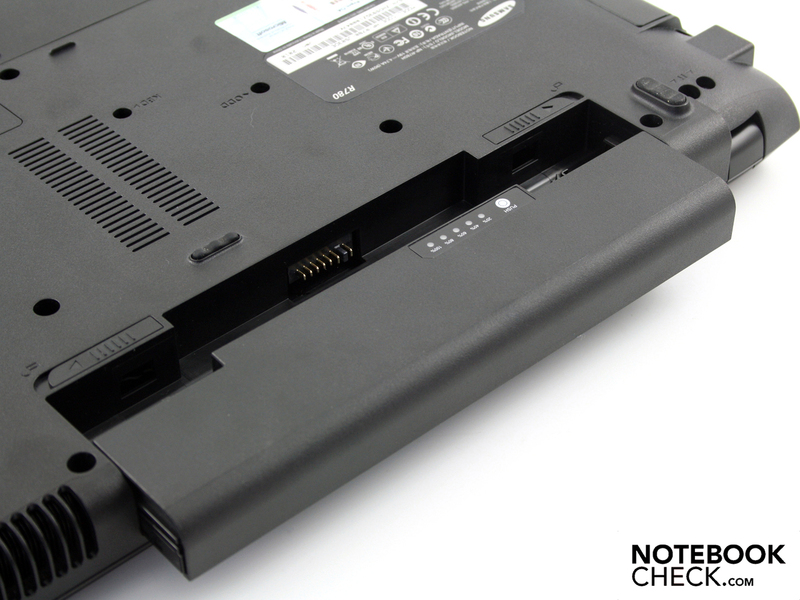 The two openings on the bottom provide the option to exchange the hard disk, RAM or WLAN module. That doesn't apply to the processor. 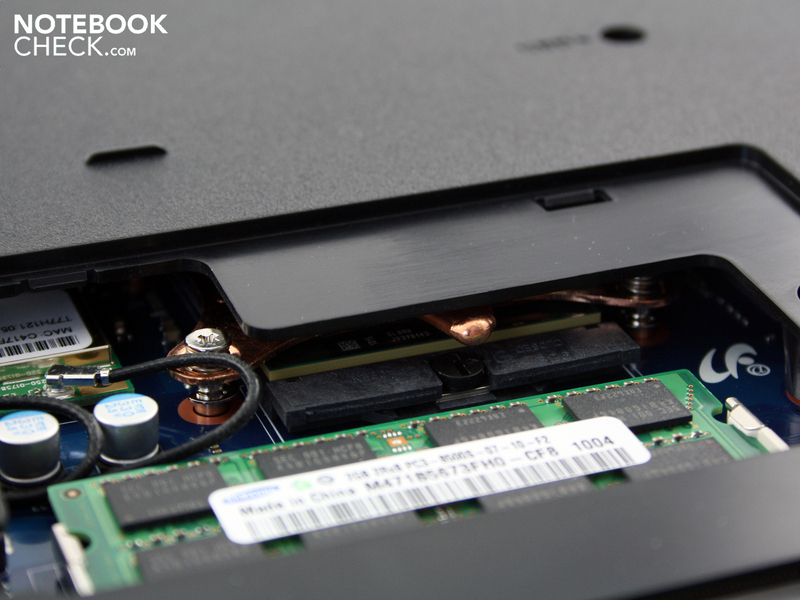 The Intel Core i5-520M is inserted but to exchange it, upgrade fans have to remove the entire base plate. We almost find the entire range of current sockets in the connectivity. Aside from Ethernet LAN and VGA (D-Sub), we discover a HDMI-out on the left. 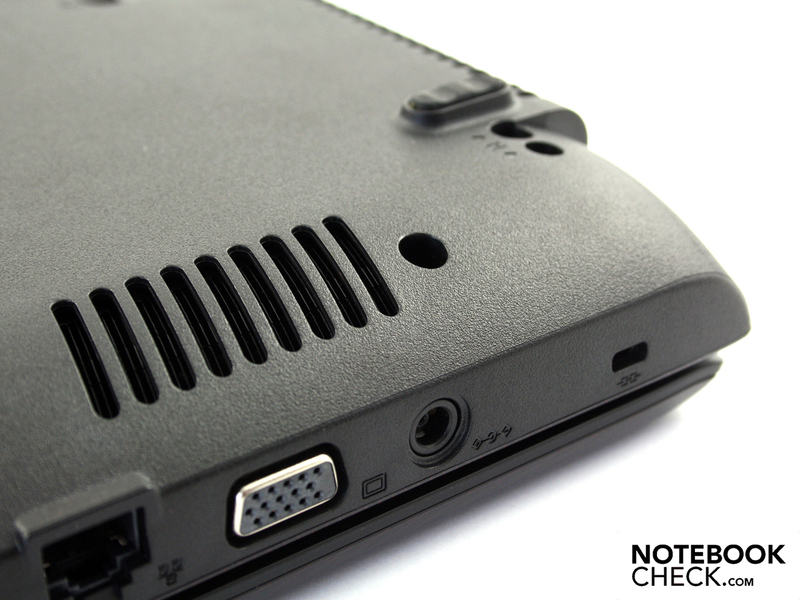 An ExpressCard34 slot is also onboard. 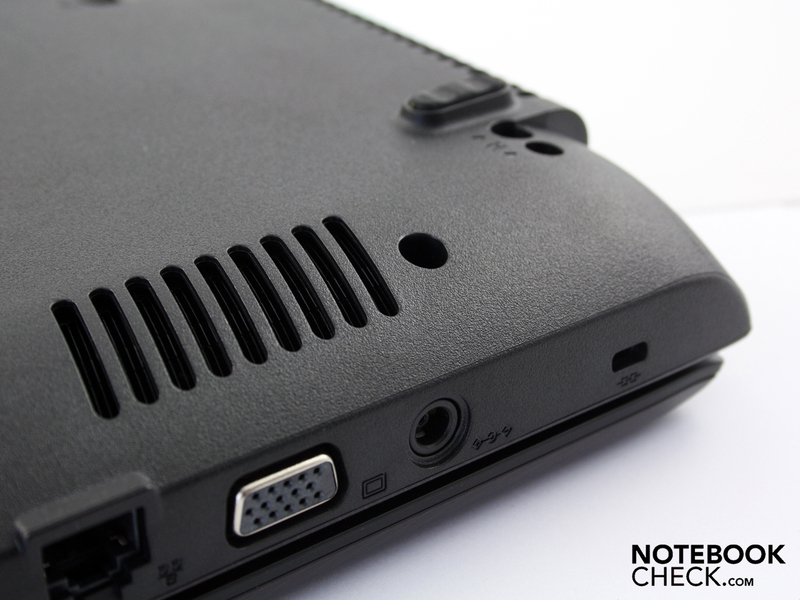 Extensions, such as sound cards, memory cards, TV cards or controllers can be inserted here. The entire left side is occupied by plugs. In order to save a bit a place, Samsung combined the eSATA port with a USB. So if you want to use an eSATA HDD, you'll only have three USB ports left. The connections are accumulated on the left side. That's practical for righties. The mouse can be placed on the right where cables aren't obstructing. Lefties are at a disadvantage because especially cumbersome eSATA and HDMI cables are annoyingly in the external mouse's activity area. It's a pity that the place on the rear isn't at all used for connections. The submerged hinges prevent the use of this side completely. The cardreader has been placed solitary on the R780's front. It's closed by a plastic dummy so that it's first seen at a second look. It's difficult to insert a memory card in the standing notebook. We have to lift it a bit because the slot is almost on the table's level. The chiclet design doesn't fit into the concept with its poor feedback. The keys have a distinct pressure point and a large stroke length. The stroke is, however, indistinct because of the yielding keyboard embedment. 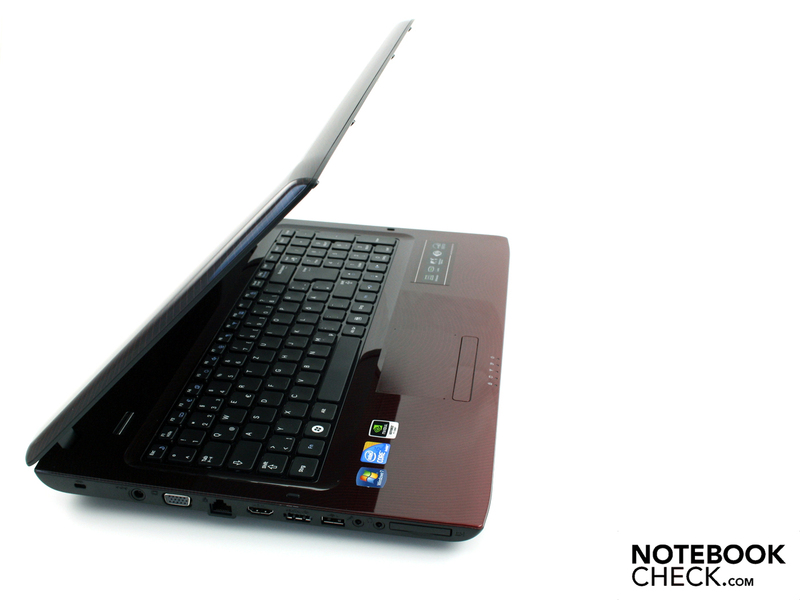 The 15.6 inch R580 has been built much more stable in this regard. On the other side, the large key gaps and the well-made layout simplify the frequent typist's work. 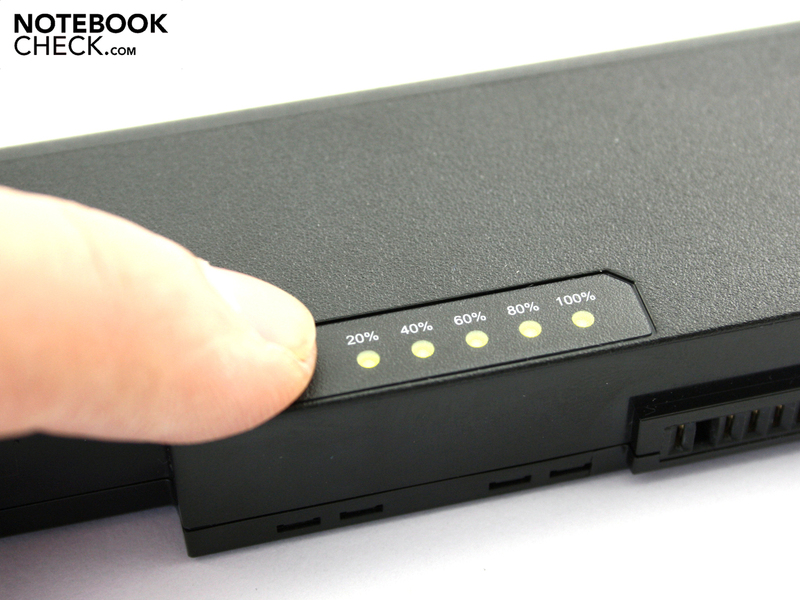 The numerical pad makes it easier to input numbers or using the calculator. We aren't happy with the squeezed in, too small arrow keys. The 17.3 incher would have had enough place to stretch the key field a bit towards the lower edge. If you're controlling a computer game with the arrow keys, you'll soon get annoyed by the frequent misses. The mouse substitute is on the same level as the wrist-rest. A less slippery, transparent coating marks the sensitive area. Lighted markings (blue LEDs) in the pad's four corners make sure that the user doesn't miss the sensitive area with every touch, even in darkness. 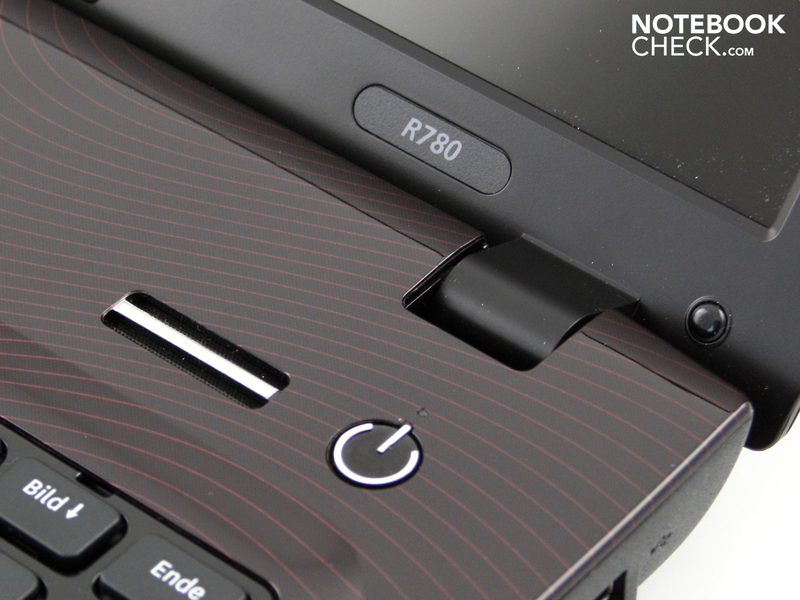 The visibly unmarked multi-touch touchpad has a vertical and horizontal scroll bar. The user can, for instance, zoom or rotate pictures with two finger gestures. 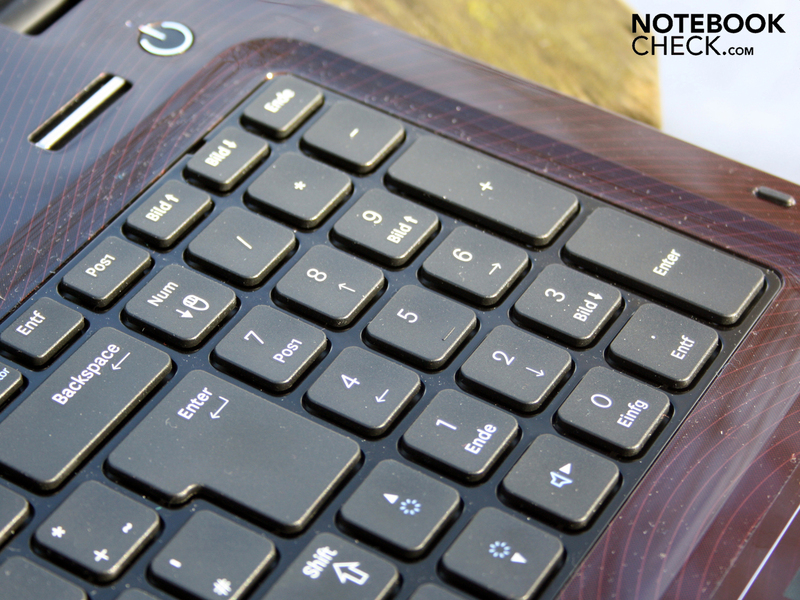 The pad's keys have a loud click, clatter and they make a low-end impression. The Samsung R780-Hero's display has a resolution of 1600x900 pixels, which is typical for the 17 inch class (WSXGA). A HD Ready screen (1366x768) would have been inappropriate. The screen (type Chi Mei N173O6-L02) doesn't have an AR coating. 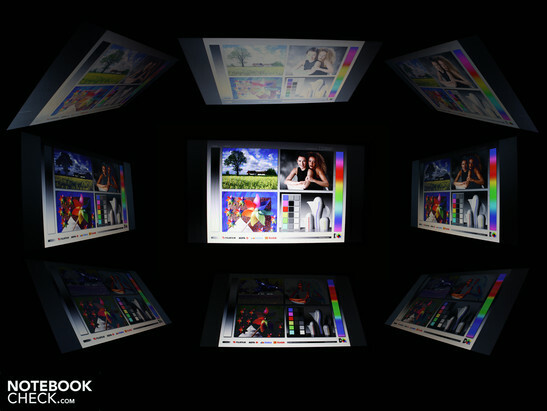 Thus, user's have to count with reflections in unfavorable background lighting. The glare-type screen deceives the spectator's eyes and we see feasible, contrast rich colors, despite the low contrast of 219:1. We would have hoped for contrasts beyond 400:1 to satisfy the notebook's multimedia claim. 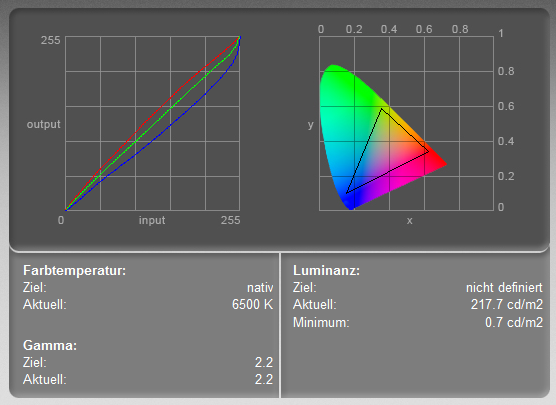 The R780 hasn't been given the ability to display a wide color range (GAMUT), either. Our iOne measuring device only established a small color space. 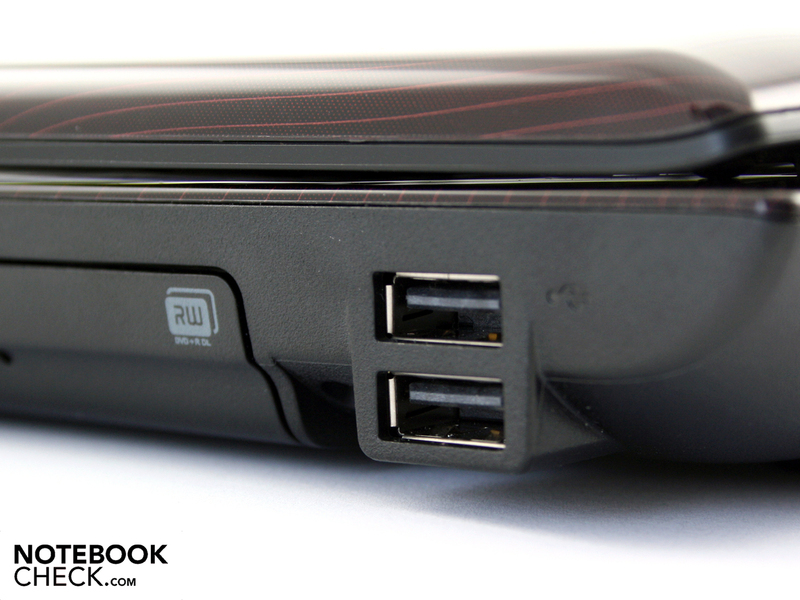 The 17.3 incher has this flaw in common with its 15.6 inch sister model, R580-Hawk. 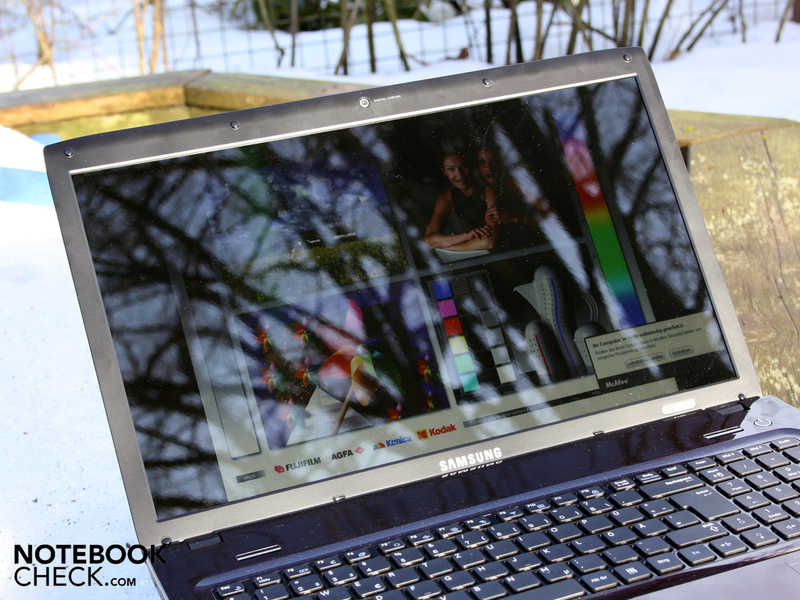 The 17.3 inch display's LED backlight lights the screen up to an average of 207 cd/m2. This is more than sufficient for indoor use, but it should have at least been 250 cd/m2 for use in sunlight. The glare TFT isn't much use in daylight. 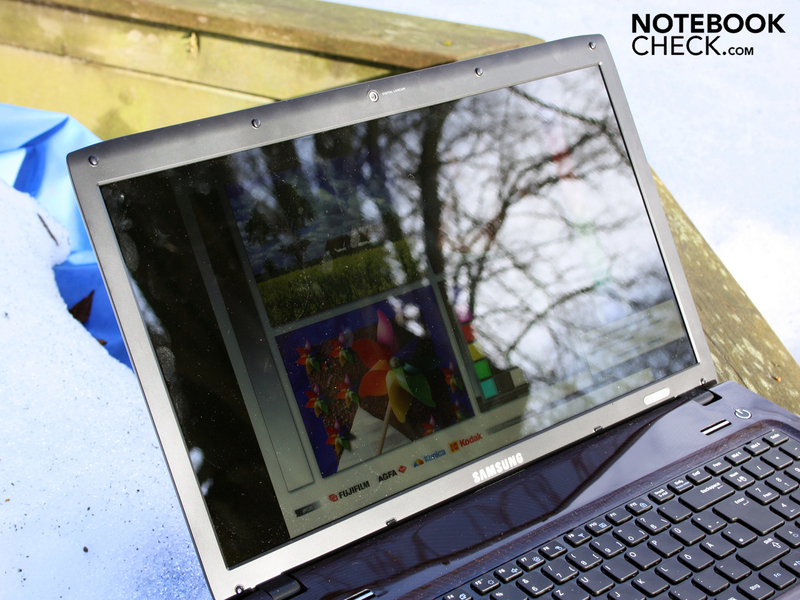 Reflections make visibility difficult as soon as sunlight directly falls onto the screen. In connection with the high-gloss surfaces susceptible for greasy fingers and the weight of 2900 grams plus 455 grams for the adapter, the use as a mobile companion is made difficult. The typical place of employment for the Samsung R780-Hero will likely be the home office or living room. The vertical and horizontal viewing angles are equally poor. Our view can deviate up to 35 degrees on the horizontal plane before the display dims and the colors start to falsify slightly. This effect already starts at a 10 degree deviation from the front on the vertical plane, especially when you're looking upwards. 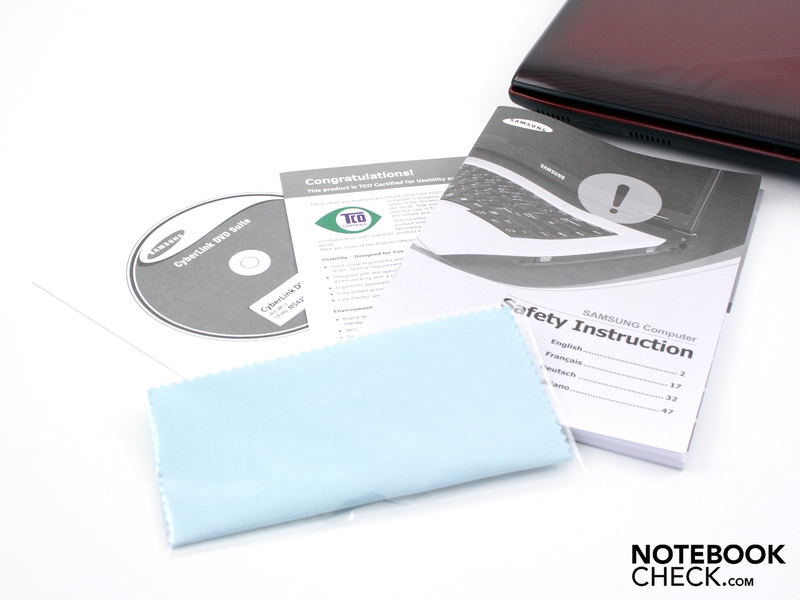 A notebook TFT has to have good viewing angles so that the viewer can recognize colors and writing with a consistent color impression from the sides or above. This demand is mandatory for a multimedia notebook. These notebooks are used for games, office tasks and movies. Even several spectators have to have a good view at the same time. Intel's Hyper Threading joins in. This function complements both physical cores with two virtual ones. Applications can thus call upon up to four cores. The above mentioned Turbo Boost also applies to the virtual cores. It should be mentioned that the initially named maximum clock rate never is reached by all cores simultaneously, but only is reached when the entire computing is managed by a single core. 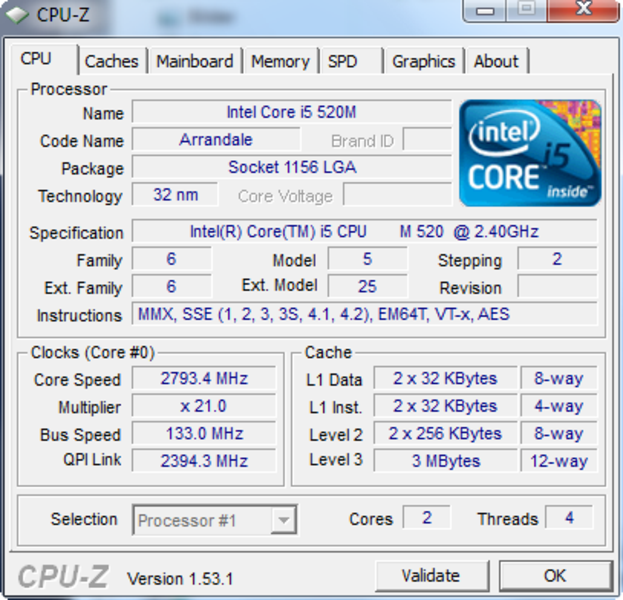 The Core i5-520M is accompanied by a 4096 MB DDR3 RAM. 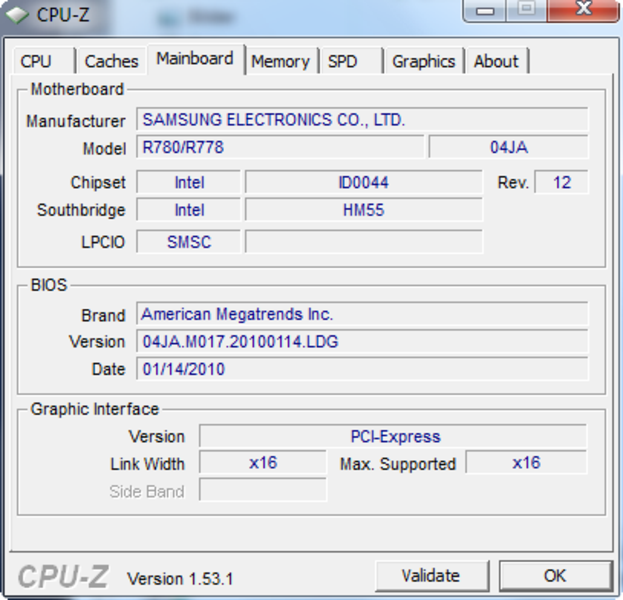 It has been placed on two Samsung RAM module and has established itself as standard for Windows 7 systems of this price class. 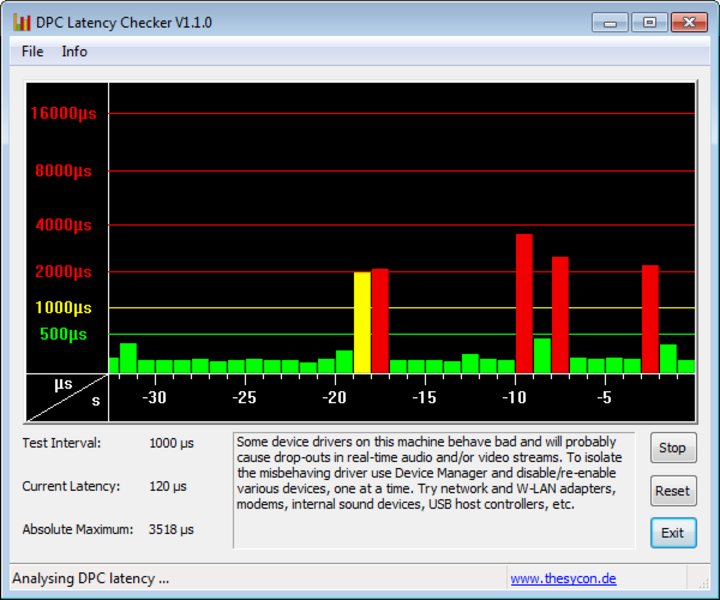 We've taken a look at the latencies with the DPC Latency Checker tool. 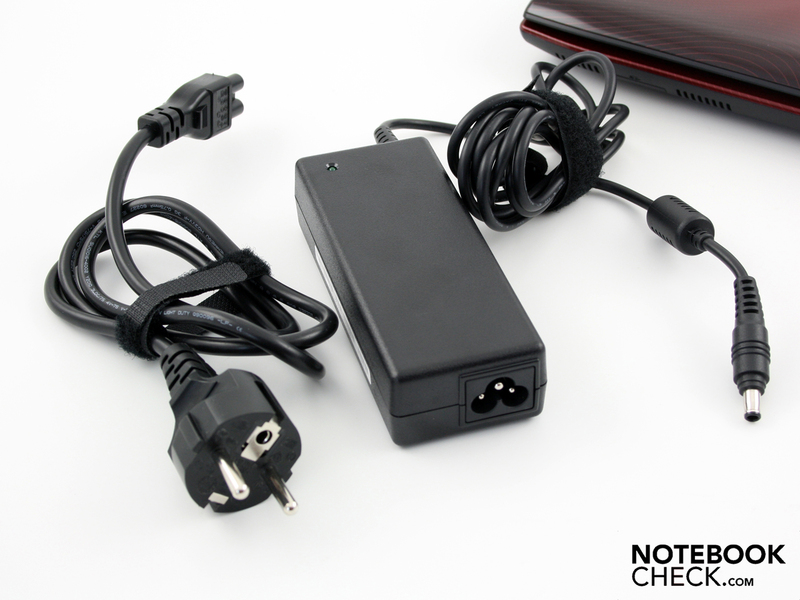 It can come to problems when external devices are connected if these are too high (e.g. sound crackling with external sound cards or short interruptions in real time audio). The R780's rates were partly over 2000µs. The cause for this is erroneous drivers of internal devices, such as the WLAN adapter, sound card, USB host controller or others. Disabling these one at a time can reveal the faulty driver. A participant of this good PCMark Vantage rate is not least the 500 GB hard disk from the same manufacturer. The 6419 3DMark strong GeForce GT 330M only has a slight impact on the PCMark. 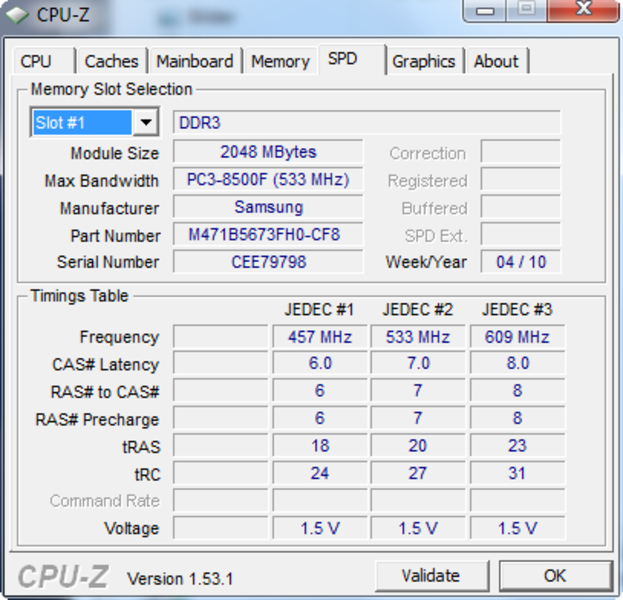 The i5-520M CPU in the Samsung R780-Hero has a high computational speed. The turbo boost function provides high-performance, no matter if with or without a multi-core use. 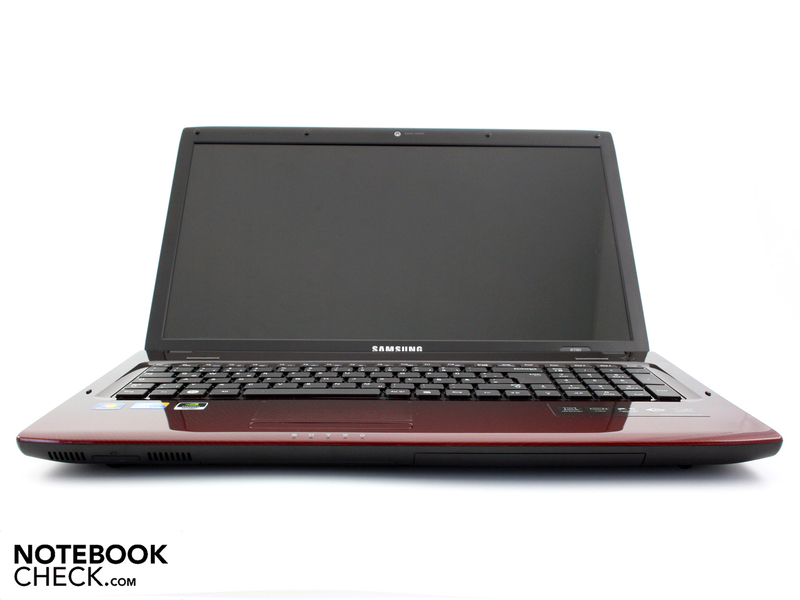 The Core i5-520M is faster than, for instance, a Core 2 Duo T9800 with 2.93 GHz in most processor benchmarks. 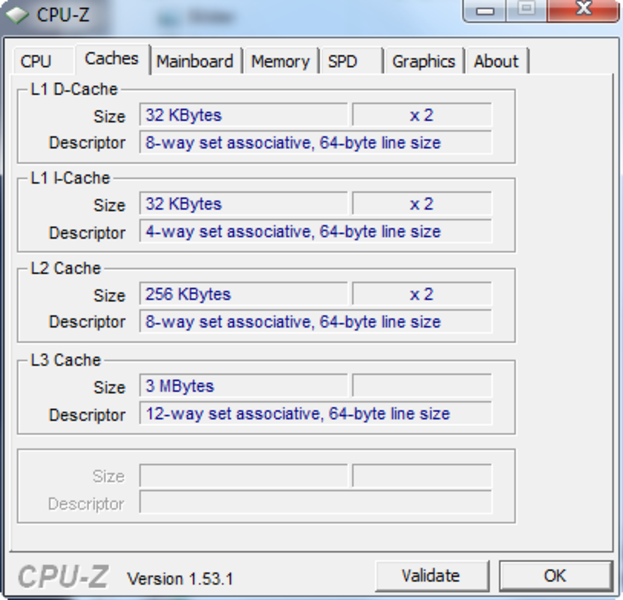 The sister model, i5-430M (2.26 - 2.53 GHz) proves to be weaker in pure multi-core computing tasks. But there are only 428 points (R780-Hero 6.817 points) separating both processors in Cinebench R10. 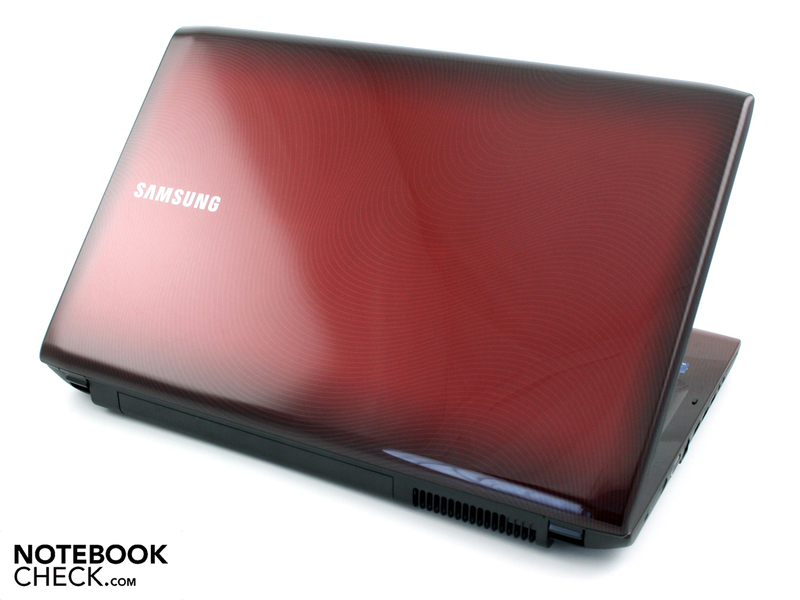 A fast 5400 rpm hard disk from Samsung supports the processor. The 500 GByte HDD (Samsung HM500JI) reads data from the disks with a rate of 67.7 MBytes/s (Sequential Read). This helps the R780 achieve good rates in the mentioned PCMark Vantage test. 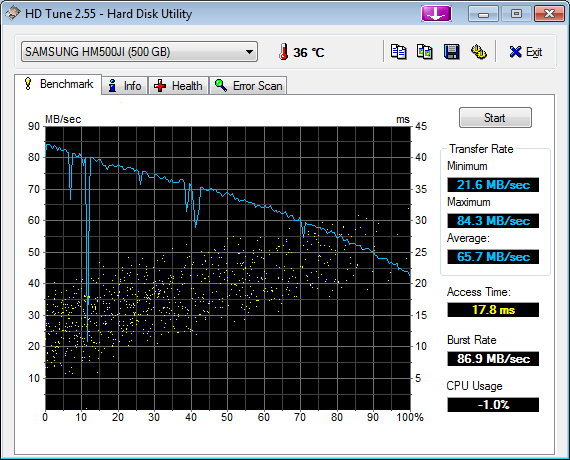 The HDD is very quiet in use. Read or write processes don't cause a clacking or rattling. Samsung uses an Nvidia GeForce GT 330M with a 1024 MB DDR3 memory as the GPU. The GPU has a clock rate of 575 MHz, the memory 790 MHz. The 15.6 model, R580-Hawk, is based on the very same GPU with the same clock rate. So, it's not really surprising that the R780-Hero's 3D benchmarks and gaming tests are very similar to those of the R580. The GT 330M is a midrange graphic, which is confirmed by gaming tests and benchmarks. The 3D benchmark, 3DMark2006, finishes with 6419 points (1.280 x 1.024). Thus, the GT 330M is on almost the same level as a Mobility Radeon HD 4650 in combination with a strong dual-core processor. A modern ATI GPU, such as the HD 5650, can only achieve almost 500 points more in 3DMark2006. This, however, only applies in combination with a significantly stronger Core i7-720QM. In Acer's Aspire 8942G-334G64Mn with an i3-330M, the ATI GPU only achieved 6540 3DMark2006. 3DMark2006 is an indication for the 3D performance of a mobile system. But gaming tests have already often proved that some mobile GPUs achieve good frame rates in games despite poor 3DMarks. The true gaming power is shown by trying out various, more or less new computer games. The following benchmark ranking points to a multimedia notebook, on which many current games will run smoothly (>25 fps). This has its price: reduced details and resolutions. The full native resolution of 1600x900 pixels is almost never possible in high details for current games. The Samsung R780 achieves 27 fps in Risen's medium details (1024x768, medium, 2x AF). Risen isn't playable any longer in the maximum WSXGA resolution and high details (4xAF). If you want to play this role game sensation in the highest resolution and with medium to high details, you'll at least need a GeForce GTX 260M or better yet, an ATI Mobility Radeon HD 4850 beside a fast processor alá i7-720QM. The implanted GT 330M is evidently too weak for Risen. Crysis isn't smoothly playable in high details and low resolution (1024x768) with 22 fps. The shooter doesn't seem to benefit from the Core i5's hyperthreading. 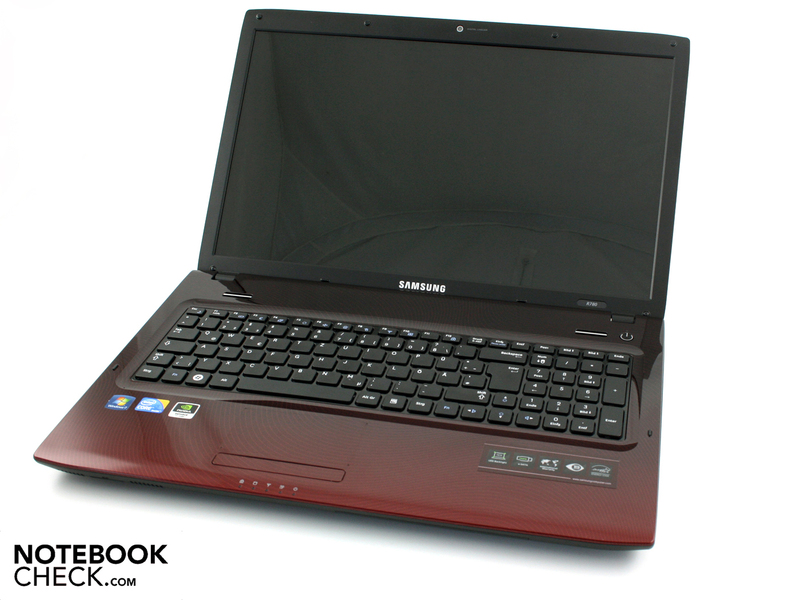 Even a T6400 (2.2 GHz), as in Samsung's R522 (Mobility Radeon HD 4650) achieves a better frame rate with 28 fps. 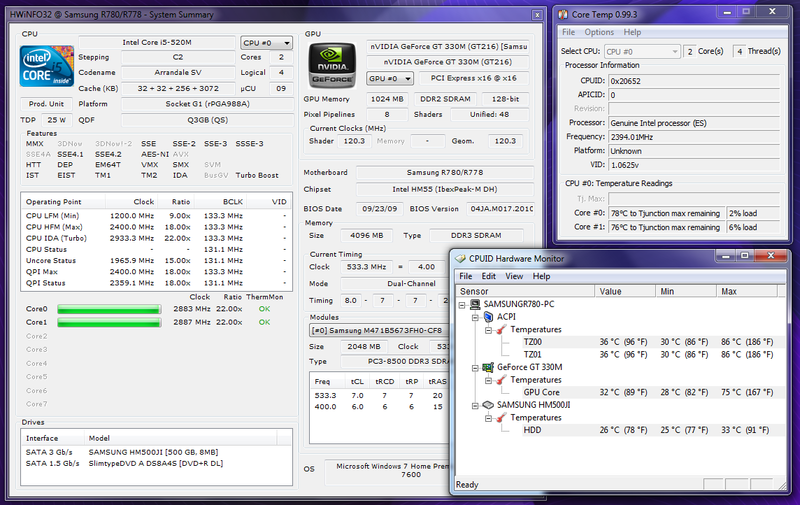 The Samsung R780-Hero is on the low level of a GeForce GT 240M in Crysis' GPU benchmark (1024x768, high details). Crysis is first playable in an even lower resolution. To play the game smoothly in the native WSXGA, the Core i5-520M would have to be accompanied by a Crossfire ATI Mobility Radeon HD 4870 X2. The game is said to have a multi-core affinity, which we can confirm. The i5-520M test system reaches a frame rate for which a strong GPU (GeForce 8800M GTS, GeForce 9700M GTS) has been needed up to now. Despite all the praise, WiC is only playable in 1024x768 pixels (high details) with 29 fps. Users would do better with an ATI HD 5650, because it reaches almost 45 fps in combination with a similarly strong processor. In order to gain a buffer on the HD resolution, it would have to already be a HD 4850. This shooter benefits from the i5-520M's turbo boost. The game runs with 66 fps in 1024x768 pixels and high details. That leaves a lot of room upwards. 1600x900 pixels are only just playable in high details. The action game runs smoothly with 35 fps in 1024x768 pixels and high details. So, there is no buffer to change to the HD Ready resolution (1366x768); you shouldn't even consider 1600x900. FarCry doesn't care at all for the strong processor. 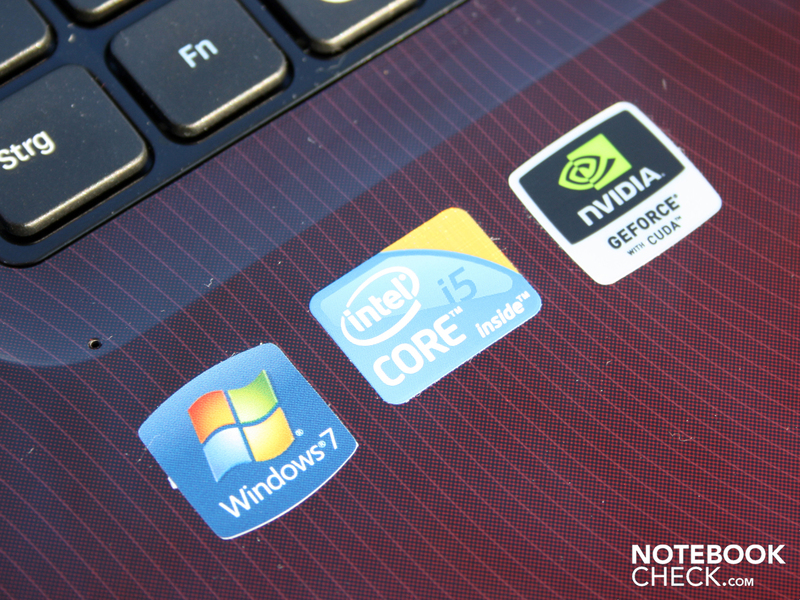 The fast quad-core i7-720QM also reaches 35 fps with a GeForce GT 330M (Sony Vaio F11Z1). The race game is only just playable in a reasonable resolution. 29 fps are reached in 1280x1024 pixels (high, 2xXMSAA). If you'd like to treat yourself to the race in the native HD+, you can do it by compromising on medium details. The 50 fps (1280x1024) leave enough room. The game calls for a strong graphic card for a high resolution (1280x1024) and high details (very high). 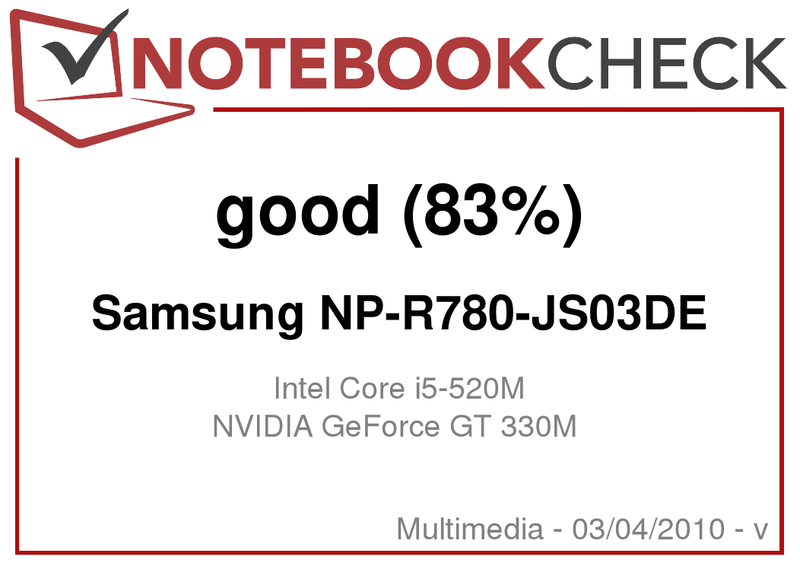 That still just possible with the GeForce GT 330M. We assessed a playable 26 fps. The game stutters every now and again when scrolling or zooming. To play Anno 1404 in an attractive WSXGA resolution with high details, the user needs at least a GTX 260M or a HD 4850. They supply well over 40 fps in 1280x1024, which move 1600x900 into a realistic field. F.E.A.R. 2 can't impress the Samsung R780-Hero. The horror shooter can be played smoothly in a high resolution (1280x1024) and high details (high, 4xAA): 34 fps. This allows the user to switch to HD Ready without a performance loss. However, the details and antialiasing have to be reduced for the native 1600x900. The system noise belongs to one of the prototype's positive traits. Surfing, writing emails or taking care of Excel charts - all of that works with almost no fan activity. When the active fan does turn on for a low or short load, then it turns itself off immediately a short time later. Samsung's Silent Mode doesn't even have to be enabled for the fan to react so quietly. If the user selects this mode via FN key, the energy profile switches to energy savings mode. The most important thing about Silent Mode is that the fan reduces its speed significantly (under load) or is even disabled (low load, idle). Silent Mode limits the processor rate to 1.2 GHz. This is the clock rate that the 520M also has in energy savings mode. 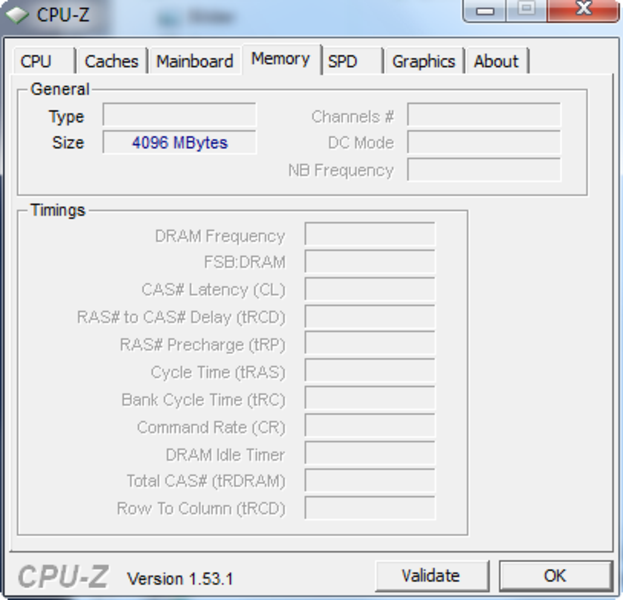 Clock rates of 2.4 to 2.8 GHz are possible in normal use with turbo boost. Short: Users who want a quiet as possible operating noise will always have this mode enabled and even save electricity this way. The performance loss during simple tasks, like browser, email or Word, is minute. The also available Speed Mode didn't prove to have any positive effects on the CPU or GPU performance in our tests. The fan's revolution or the processor clock rate didn't increase in Speed Mode, either (in comparison to normal mode). The cooling system turned up to 35.3 dB(A) in computer games. Assuming an idle base level of 29.9 dB(A), it's a very low rate for a high-performance system with a Core i5 and dedicated graphics. The fan merely turns up to 38 dB(A) in a load scenario that we insinuate with a stress test. The R780 proves to be a bit quieter than its 15.6 inch sister model, R580, with an identical configuration. The Samsung R780 stays cool during a typical operating situation of short load and long idle states. 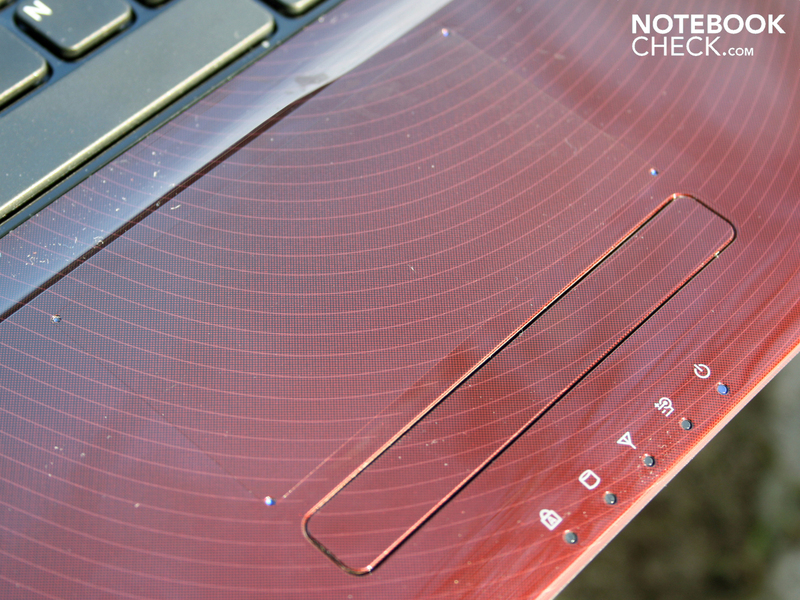 The numerical pad merely heats up to 24 degrees in idle mode. The warmest spot on the base plate is only 29.7 degrees. 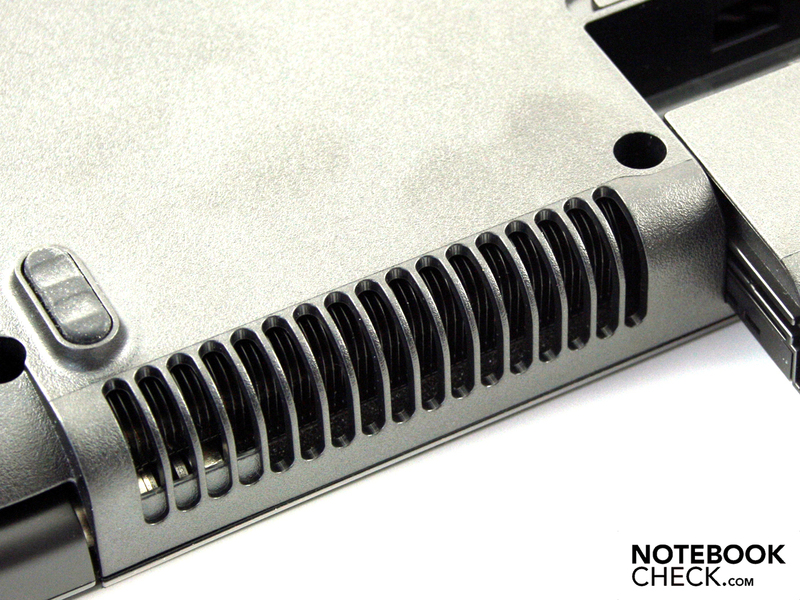 The waste air on the case's upper side is harmless, even under load. We didn't measure more than 31.4 degrees Celsius on the wrist-rest after a stress test of processor and graphic card. The work surface's maximum is about 33.3 degrees. The bottom records a cooler rate during constant activity than in idle. The reason: The previous stagnant air is conducted out of the case permanently. Thus, a use on the lap is possible without problems, even for computer games or processor-biased tasks. Knowing this, it's not really a wonder that the R780 survived the 12 hour stress test without taking damage. The graphic card never surpassed a temperature of 86 degrees during the long load. There weren't any crashes. A 3DMark2006, executed afterwards, reached the same 3DMarks as in the normal test: 7134 3DMarks (1280x800!). (+) The maximum temperature on the upper side is 33.3 °C / 92 F, compared to the average of 36.5 °C / 98 F, ranging from 21.1 to 71 °C for the class Multimedia. The loudspeakers are above the keyboard. 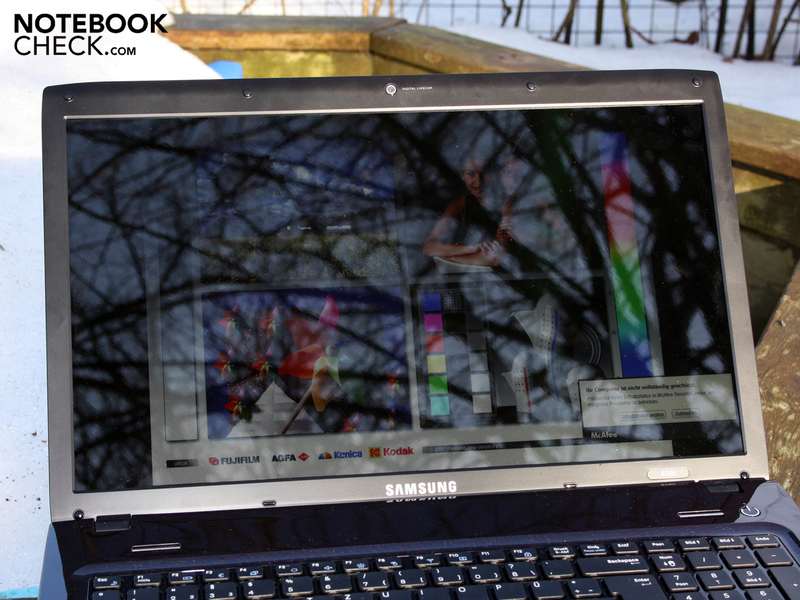 The Samsung R780 doesn't live up to our expectations for a multimedia notebook in the acoustic field. There is no subwoofer. The sound accentuates the mid-ranges, whilst the trebles and basses are ignored. 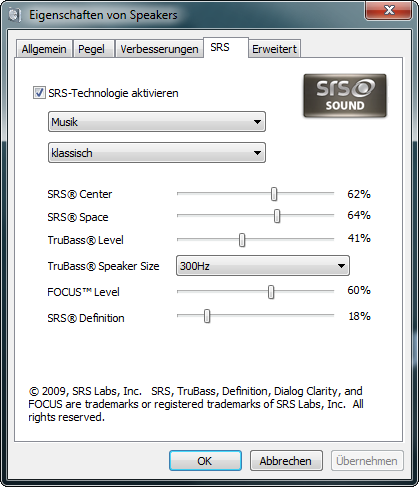 If you want a hint more of deep pitches, you can increase the TrueBass level in the SRS sound options (audio devices properties). The membranes start to scratch in maximum volume. They are overtaxed. You can take delight in a hiss-free output when an external sound system is connected. The output level is on a sufficiently high level. 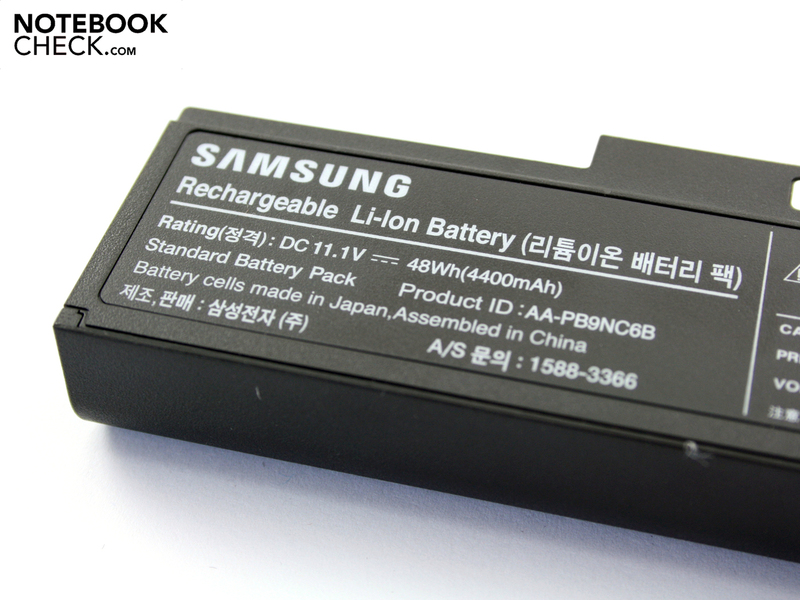 The Samsung R780's battery life is 2:12 hours (132 minutes) in WLAN surfing and medium brightness. We downloaded a few YouTube clips and visited many news sites and websites in this time. How long does a DVD movie run? Our test established 102 minutes. The 4400 mAh battery is ready for the next session after 2.30 hours. That's how long the battery needs for recharging after a complete drain. If you are very frugal and only use WLAN in the lowest brightness, you can draw out a good three and a half hours with maximum energy savings options. The maximum - but unrealistic - runtime (BatteryEater Reader's test) is 224 minutes. The feasible runtimes, for a 17.3 incher with a strong Core i5 processor, are verified in the low power consumption. The R780-Hero needs 14.2 watts in idle and Silent Mode (maximum energy savings). The realistic idle situation with enabled WLAN and highest brightness is 21.6 watts, though. When the Intel Core i5-520M and the GeForce GT 330M compute with full power, then the effective power is 69.6 watts. We established these rates in a stress test with Prime95 and Furmark. 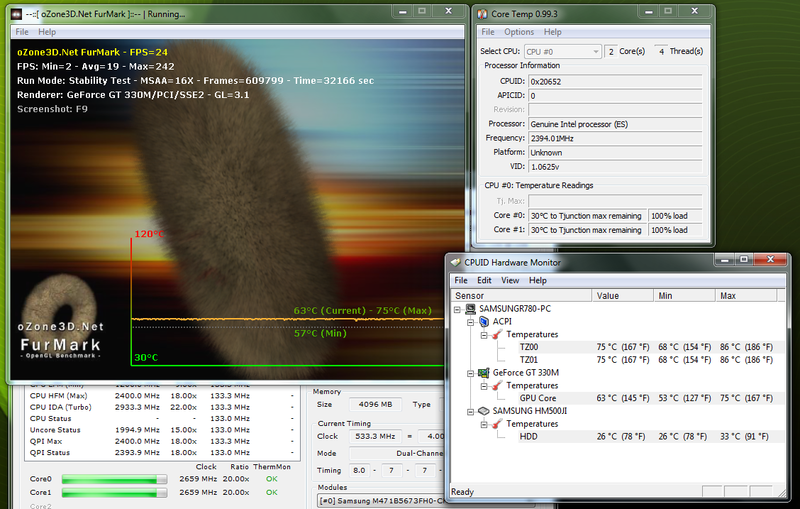 The power consumption is 64.7 watts during 3DMark06. The 90 watt adapter is sized adequately for these rates. 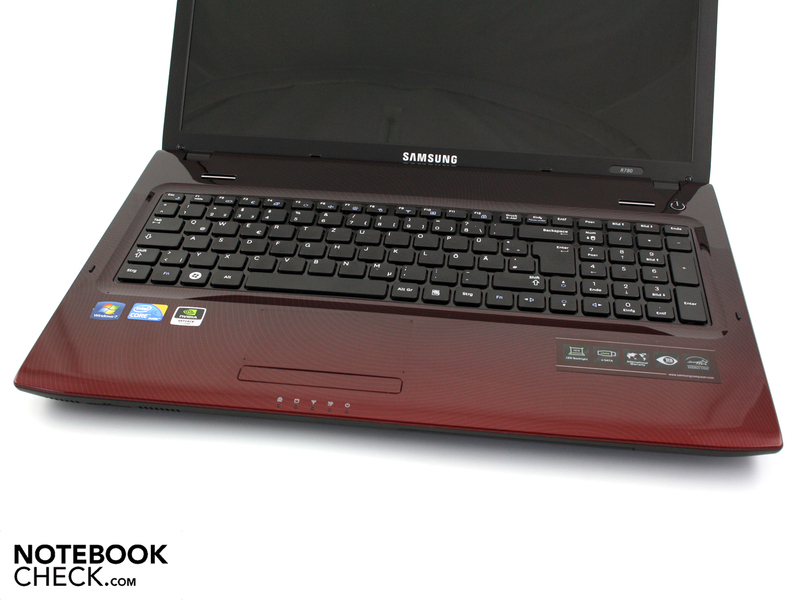 The Samsung R780-Hero is a 17.3 incher that tries to unite the strengths of an Office notebook with those of a multimedia laptop. 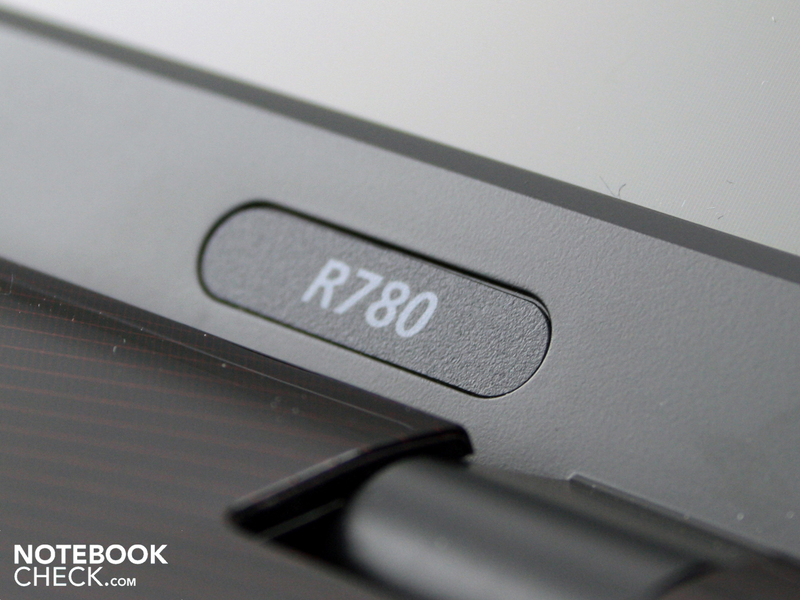 The R780 bids a very good cooling system with Silent Mode for noise sensitive users on the ergonomic side. A fast Intel Core i5-520M (2.40 GHz) beside an Nvidia Geforce GT 330M (midrange) and a 500 GB hard disk speaks for the multimedia affinity. However, there are very obvious weak points in both categories. Frequent typists will miss a good key feedback. Music fans will be upset about mid-range heavy loudspeakers lacking bass. Movie fans won't see everything because of the acute viewing angles and low contrasts. Nevertheless, a price of currently almost 900 euro is ultimately demanded. It is an attractive value for money ratio. The all-rounder isn't perfect, but if you've got the courage to leave gaps, you'll get a system which is just as capable in computing intensive tasks as in the one or other latest game. However, many games in our gaming session had to be run with extreme reduced details. There are many 17.3 inch alternatives with a Core i5, but they all have a weaker graphic card, such as the Geforce GT 230M or ATI HD 4570 (Dell Studio 1558). 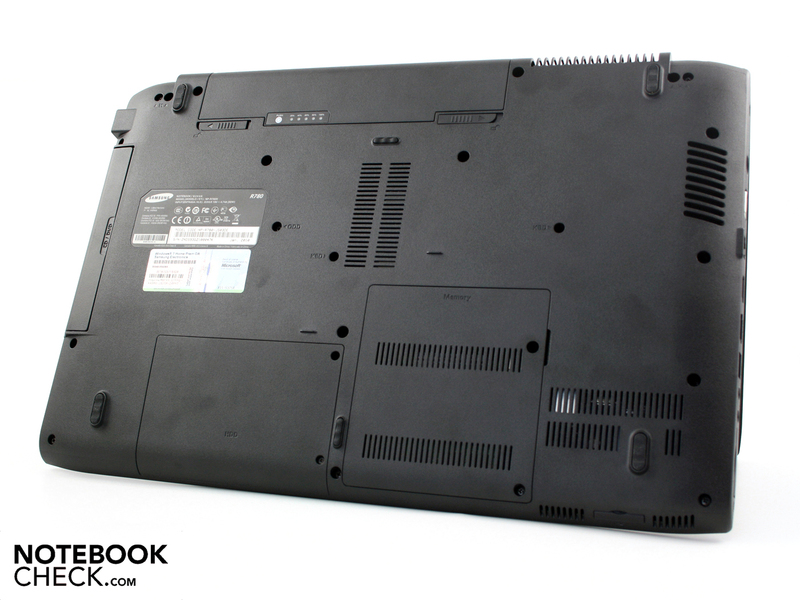 the cover for the RAM also reveals this Core i5-520M. The hard disk can, of course, be exchanged - but there's no reason for it with a 500 GB capacity. and a small capacity of 4400 mAh. It keeps the 17.3 incher running for up to 3:44 hours. The R780's quiet is very much worth praise. The cooling air is sucked in here. And it leaves the case here. The display can only be opened so far that it's enough for a use on the lap. The user can well leave the R780 closed in sunlight, though. Reflections obstruct the view. Samsung doesn't include recovery DVDs. The 90 watt adapter is never overtaxed. The bottom doesn't only reveal the battery but also two maintenance slots. The touchpad is fairly slippery, but very big. 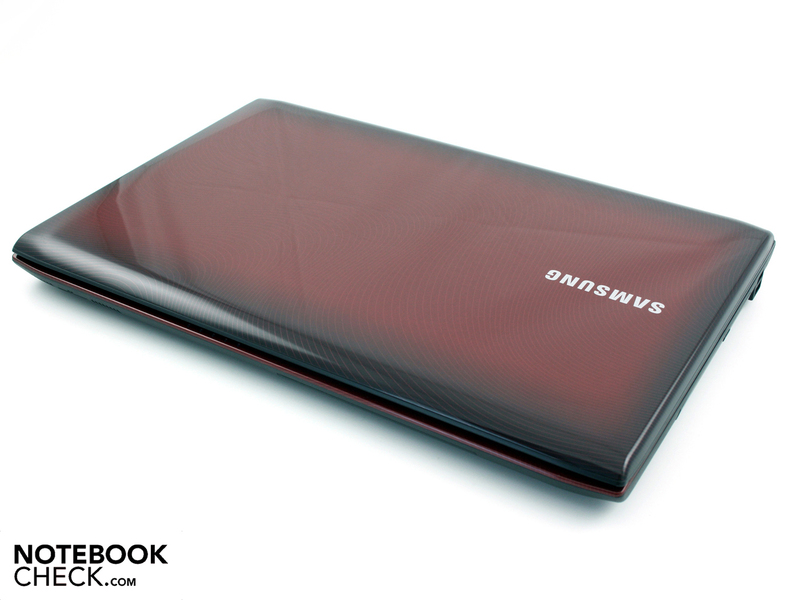 with an attractive dark red case. The attractive look can't hid the otherwise only average construction. The chassis is pliable and yielding in a few areas. Especially the lid already dents evidently under light pressure. 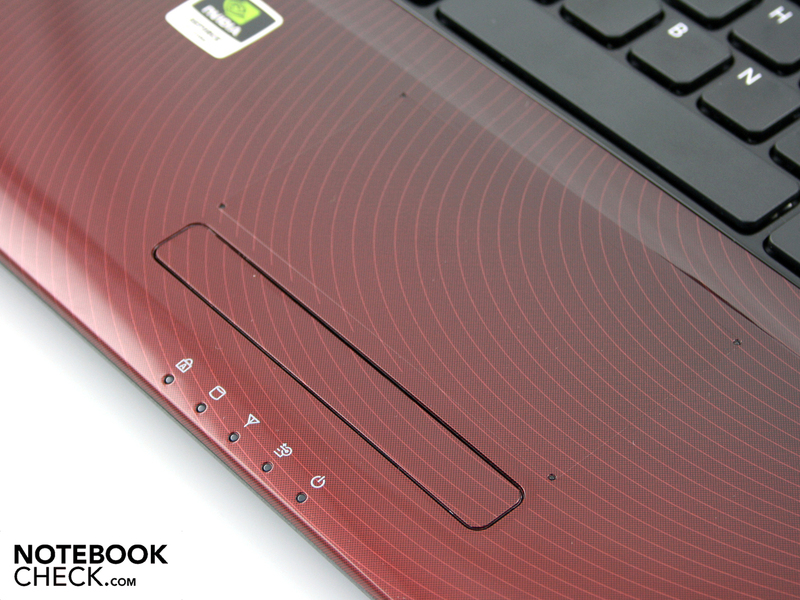 The surfaces are also very susceptible for fingerprints. 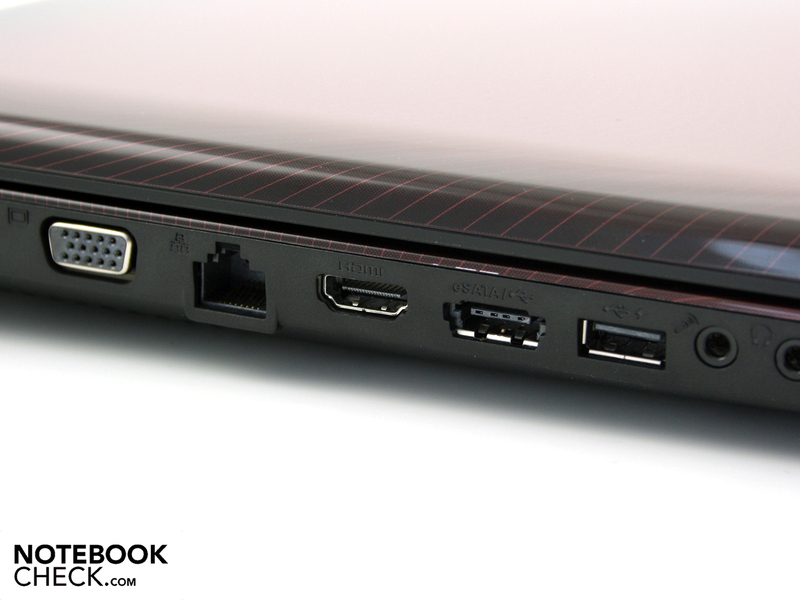 The R780 is aimed at multimedia users who are looking for a resolution of 1600x900. The loudspeakers can't live up to the media claim in any way. They emphasize the mid-ranges unbalanced and scratch in higher volumes. 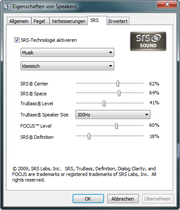 The SRS audio menu can at most improve the basses a bit. In return, the connections are impressive. Even eSATA and ExpressCard34 haven't been left out. These USB ports have been placed in the right's rear area. That minimizes cable chaos. but hate the wobbly key field. The powerful Core i5 in a very quiet and cool case. The Silent Mode, once again, is awesome. As already in the R580 - a contrast richer display with stable viewing angles. Apart from that, a firmly fitted keyboard for frequent typists would be worth its weight in gold. 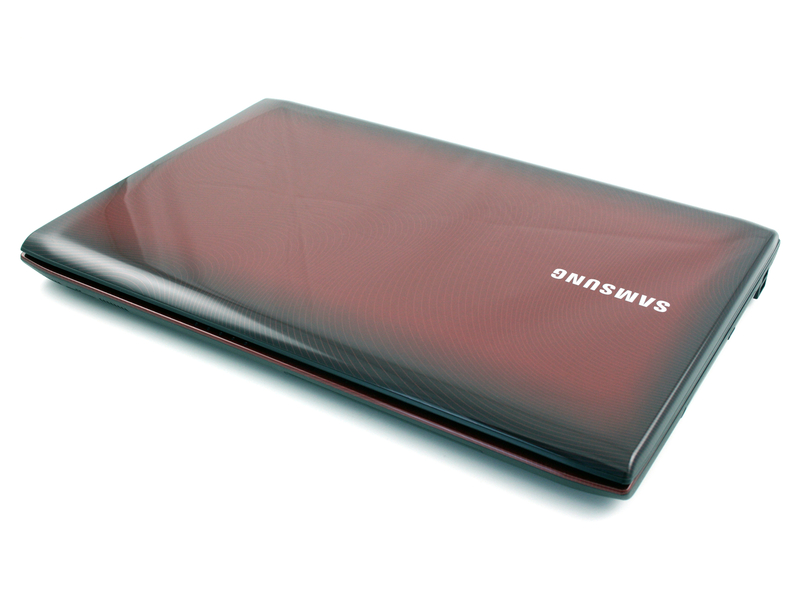 That a mainstream case can be given a high-quality look with a red imprint finish. Currently, there aren't any competitors in the less than 900 euro class with an exciting Core i5 and feasible middle class graphics combinations. If you can live with weaker graphics, the Acer Aspire 7740G (434G64Bn) might be a worthy alternative. 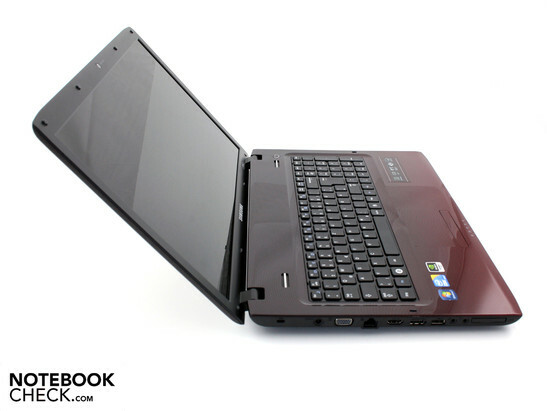 The 17.3 incher is well 100 euro cheaper, has a Core i5-430M processor and even a BluRay drive. 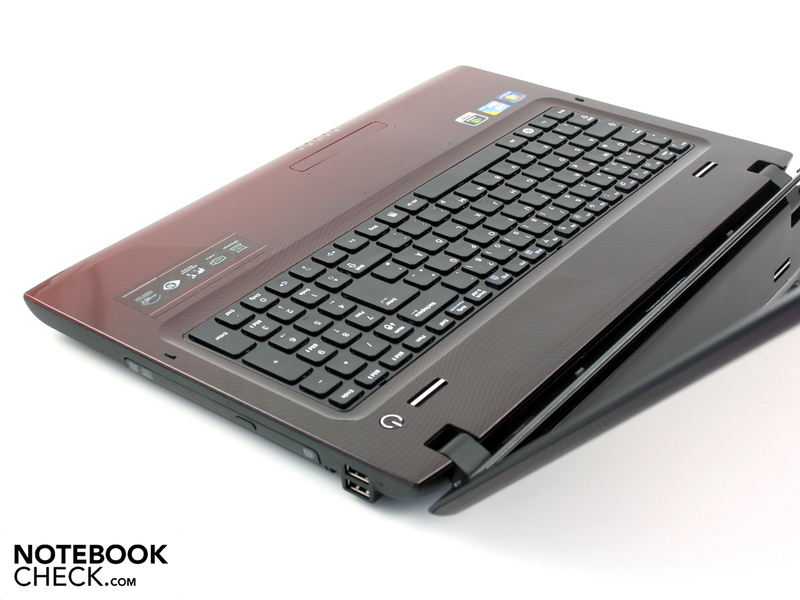 The HP Pavilion dv7-3128eg (WA003EA) for not quite 800 euro is also a 17.3 incher. There might not be a BluRay drive but there is a Core i5-430M and weak midrange graphics, GeForce GT320M.